Even a change of batting line up wasn’t able to stop Kenya from missing the ticket to the ICC World Cup Qualifiers. The Kenya technical bench reshuffled the batting in the first of the two crucial ICC World Cricket League Championship match against Scotland on Wednesday but that wasn’t able to stop the Scots from advancing to the March’s qualifiers with an eight wicket win. Needing a win to qualify, the Scots were left with an easily target of 146 and easily bashed through to the target with 132 balls to spare. After a number of misses in the campaign, Kenya coaches Thomas Odoyo and Peter Ong'ondo thought that making changes in the batting line up will do the trick and save Kenya from jaws of defeat. The promotion of Rushab Patel to the opening slot didn’t help the matters for the two former national team seamers as with only two balls into the match, the Nairobi Gymkhana batsman was back in the dugout. The coaches might have thought that his performance in the warm up against Nepal where he top scored with 27 would give him confidence into the match but that didn’t work out and Kenya were in danger early into the match after Safyaan Sharif uprooted his stumps. Rushab’s selection in the team raised eyebrows in the team as his form has not been at its best since his selection in the team. Despite the failure of Rushab, the Kenya still went ahead with the batting order that easily lost to Nepal by six wickets after posting 110. Dhiren Gondaria and Rakep Patel joined Alex Obanda at three and four respectively but they could only add on nine runs as Kenya was reduced to 31 for 3 after 10 overs. Their score was one run less of what they had scored in Nepal loss. Ten balls into the fourth wicket, Kenya inning received a major blow when Alex Obanda had to be stretchered off the pitch after Chris Sole’s bouncer crushed his helmet. At the time of his departure, the Swamibapa batsman had scored of 17 off 42 balls. Collins Obuya was the only one who was able to put on a fight in the inning with a hard fought 50 balls 26 was Collins Obuya. The boundaries were hard to come by for the former skipper as he was only able to two boundaries in 15 overs he was in the middle. Irfan Karim who was dropped to six from his opening slot could only add on nine runs as the Scots exposed how weak the Kenyan batting was despite the changes. 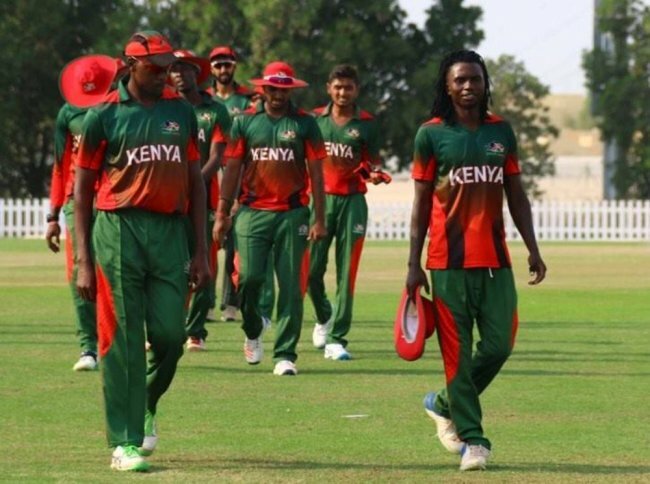 Nelson Odhiambo (15), Gurdeep Singh (11) and Shem Ngoche (15) and Emmanuel Bundi’s (11) were able to get Kenya past the hundred mark with some late survivals towards the end. In reply, half-centuries from captain Kyle Coetzer (52) and Calum MacLeod (56 not out) put the finishing touches on a game Scotland dominated from start to finish.